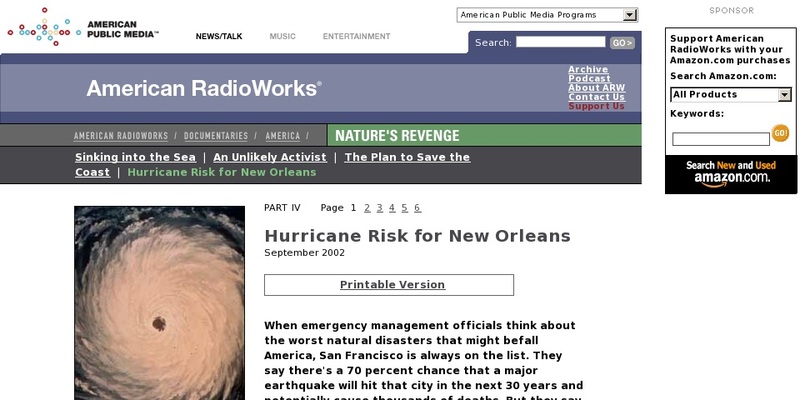 In this 2002 documentary from American RadioWorks, Daniel Zwerdling talks to a number of scientists about the possibilities of a catastrophic hurricane event in New Orleans. The site includes the original audio program, a web text version and a printable version of the documentary. This documentary is the fourth in a series called Nature's Revenge that looks at the degradation of the wetlands and coastal areas along Louisiana's Gulf Coast.